Apologies for the radio silence, awesome followers. Sometimes life just gets so crazy that blogging has to take a back seat. We always come back though! It's an obsession. I'm happy to pop back in with a new book for you to put on your reading list. 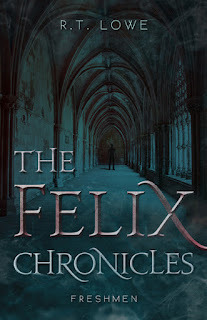 Please give a warm welcome to Randall T. Lowe and his dark urban fantasy, The Felix Chronicles: Freshmen. Reeling from a terrible accident that claimed the lives of his parents, Felix arrives at Portland College hoping only to survive the experience. In time, however, his reality star roommate shows him there is more to higher education than just classes, shared bathrooms and bad dorm food, and Felix gradually dares to believe he can put his past behind him. But a fateful storm looms on the horizon: In the nearby woods, two hikers become the latest victims in a series of gruesome murders; a disfigured giant embarks on a vicious cross-country rampage, killing teenagers who fail his 'test'; and an ancient society of assassins tasked with eradicating the wielders of a mysterious source of power awakens after a long silence. Only one man--the school's groundskeeper--knows that the seemingly unrelated events are connected, and that an eighteen-year-old boy stands in the center of the storm. Urban Fantasy is one of my favorite genres, because of all the trials and tribulations that the characters go through. They always feel so real, and I can't help but get behind them. Is it any wonder that I'm excited to see what happens to Felix? If you'd like to add this to your reading list, I'll make it easy for you. Now please enjoy a guest post from R.T. Lowe, and happy reading! · I made Felix suffer. I’m a firm believer in putting your protagonist through the wringer. He steps foot on the campus of Portland College already with a heavy heart (his parents recently died in a mysterious fire) . . . and then it only gets worse for him. · I created a world in the midst of an approaching darkness, where strange creatures roam the nearby forest and a serial killer (the “Faceman”) murders teenagers who fail a “simple” test. The encounters with the unfortunate victims are chilling, violent and bloody. I made the decision ‘to spare no gore’ after a great deal of thought, fully aware that I was potentially subjecting myself to criticism. I understood that it would shock some (and most likely remove the book from the reading lists for those under sixteen), but I didn’t want to hint at the violence or rely on my readers’ imaginations. There are characters in my book who are truly bad people (or flesh eating monsters, in some cases) and I took the position that their actions should be described in such a way that the reader will understand that there is no limit to their cruelty. And although the campus of Portland College appears immune to the spreading darkness, beneath (and within) its stately lecture halls and ivy-shrouded façades, a hidden world awaits those who can unlock its secrets. · I told the story from multiple perspectives, shifting scenes (and chronology) to keep the reader off balance. There is undoubtedly some complexity to the tale, but I believe Young Adult/New Adult readers are looking for stories that make you think. I drive the story forward through the eyes and thoughts of a dozen different characters. Some chapters seem unrelated to the “main” story (especially the prologue which takes place in the 4th century), but the pieces all connect as the plot unfolds and Felix learns that he may be ‘different’ than everyone else. · I created characters who keep you guessing. In the real world, the “good guys” can be as flawed as the “bad guys,” and sometimes the line between good and bad is a matter of perspective. I also made sure that the “magic system” in my story allows for amazing, jaw-dropping displays of supernatural power. The way I see it, if you’re going to write in the realm of the paranormal you may as well go all the way: Let’s just say you wouldn’t want to start a fight with some of the characters in my book. 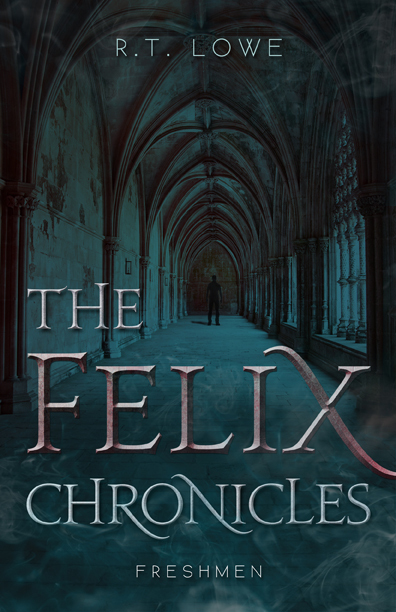 · In The Felix Chronicles, everything is at stake. I’ve always liked stories where the stakes are high, and they couldn’t be any higher than the fate of the world hinging on the outcome of a war that has raged for nearly 2,000 years. · I included humor (Felix’s roommate, Lucas, appeared on a reality TV show and he lightens the mood at all the right times) and romance (Felix has a love interest (or two) and Lucas has several as he’s not afraid to use his celebrity to his advantage) to compliment and counterbalance the action and horror. There’s much more to TFC: Freshmen, but those are some of the highlights. Once I had it locked down tight in my head I sat down and started to write. 500 pages later (and a year or two of very little sleep) I published the book. It may not be for everyone, but I suppose that’s to be expected when you write for an audience of one. And who said nothing good can come from a long commute?